This workshop focuses on the life and times of the plains Indians in the period from the start of the great westward migration to the middle of the 1800's. The activities can be done both in-doors and out of doors. Students are ushered single file into a pow-wow scenario with native music playing and drums keeping rhythm. Six drums are passed out to the students to keep time and join in with the music. 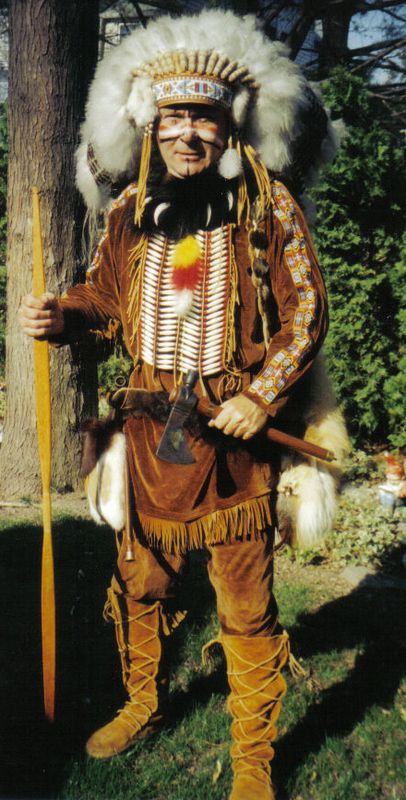 Dressed in authentic looking replica dress, with full feathered war bonnet and beaded buckskin warshirt, seated on a buffalo rug, beating his drum, Chief Lone Tail begins the class with an overview of Plains Indian culture and technology. Various tools, instruments, jewelry, feathers, and weaponry are passed around to the students to handle and observe. The first activity is the practice construction of the standard plains tipi, using the three pole and four pole methods. One model is demonstrated using foot long poles (sticks) and a cloth cover. The students can practice with these stick models before moving on to the three foot long poles to erect a larger unit. Two such tipis are available for practice as well as one cover sheet. 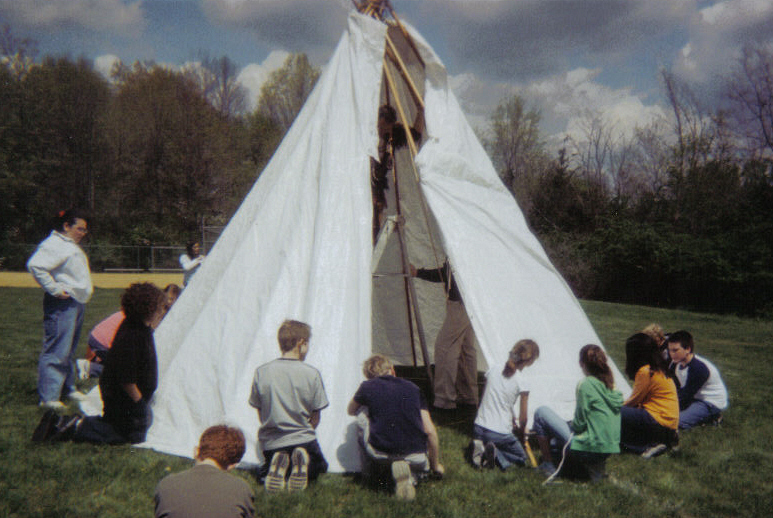 Once everyone has had a hand at erecting the smaller models, the class may move out of doors to try their hand at erecting a full size tipi using sixteen foot long poles and a light weight cover cloth, which is a white plastic construction tarp sewn to fit a 16' tipi. Once the unit is up and sturdy the students must take it down, move the poles to another site, and erect it again, this time using a canvas cover cloth, which is much heavier. This practice is repeated until all members have participated. In winter weather, snow or not, the real tipi can be erected with its water-proof ground cloth and the opening class can be held in the cold with a small, self contained fire in the center. The maximum number of students able to get inside in the cold weather is twenty-five. Its tight but cozy and dry and wind free. The bear, sheep, and buffalo hide blankets become very popular. If the tipi construction must be done indoors, each pole has a a rubber foot attachment to grab onto the floor as well as a full circumference restraining rope around each pole on the bottom. Hunting 'still' and 'running' game is practiced by all students who must shoot at least three ball tipped arrows at stationary balls, at a distance of 25 yards. They progress to shooting moving balls rolled on the ground by their teacher. As tempting as it may be, they are asked to please not shoot their teacher! This exercise can be done indoors as well as out. Two buffalo hides and horned heads are available for handling and become the focus of a discussion of the importance of this animal for survival and the object of our buffalo hunt. A full scale buffalo replica which rolls on wheels is matched by an elevated, saddled horse. Students must mount the horse, prepare their three arrows and short bow, and charge the moving buffalo in an attempt to bring it down with an arrow shot to the mid section. Both animals must be pushed by fellow classmates in a prescribed pattern. Speed is kept at a safety margin of only a few miles per hour,... but with what is going on, two miles an hour seems like twenty. As a work in progress attempts are being made to motorize the buffalo and have him self propelled and free wheeling; “Catch me if you can!” idea here. In closing, a full participation exercise has the grade level making individual war bonnet feathers for the construction of a school owned head dress. Several weeks prior to the days presentation, the administration will have informed Hands-on-History of the color scheme chosen for the forty feather war bonnet and trail. This would include the colored head cap, main feather, brow banding and brow feather color, tip feather and horse hair. The trailing train cloth will match the color of the cap and all extra feathers will be added to it. Each student will have an opportunity to make one feather as his or her contribution to the larger project. The school will be provided all the necessary materials and instructions for successfully making the head dress. This project has proven to be very rewarding and is well worth the added cost for only the materials.